This is a translation of an Iwata Asks interview originally posted on the Nintendo of Japan website on 22nd November 2012. Today, we’re going to be talking about the Nintendo 3DS software title Professor Layton vs. Phoenix Wright: Ace Attorney. At first glance, at least, LEVEL-5’s Professor Layton1 series and Capcom’s Ace Attorney2 series appear to have always existed completely independently of each other. Now, however, both series are flying the nest of their respective creators for the first time and joining forces in a new title. I simply had to talk to the people responsible, therefore, and today I’m joined by the “fathers” of the two series. 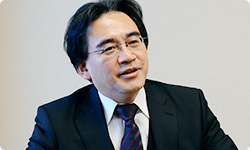 Hino-san, this is your second3 Iwata Asks, isn’t it?1. The Professor Layton series: a series of puzzle-solving adventure games. The first title in the series was for the Nintendo DS system, and was released by LEVEL-5 in Europe in July 2007. The series contains six titles, and in 2010, an animated movie called Professor Layton and the Eternal Diva was also released in the UK. 2. The Ace Attorney series: a series of legal battle adventure games. The first instalment was for Game Boy Advance, and was released by Capcom in Europe in March 2006. At the time of writing there are five titles in the main series. A related spin-off title (which is not part of the main story of the series) called Ace Attorney Investigations: Miles Edgeworth is also available for the Nintendo DS system.3. 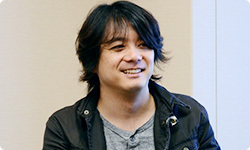 Hino-san also appeared in the first Volume of Iwata Asks: Nintendo 3DS Third Party Game Developers, when he discussed the fifth title in the Professor Layton series, Professor Layton and the Mask of Miracle, which was released for the Nintendo 3DS system. That’s right. It’s good to be back. As for you, Takumi-san, this is your first time, isn’t it? Yes, it is. It’s nice to meet you. It’s nice to meet you too. Thank you for appearing in that Nintendo Direct4 video the other day, by the way.4. Takumi-san appeared in a Japan-only Nintendo Direct video that was broadcast via the internet on the 25th of October 2013. He was asked about the production secrets of Professor Layton vs. Phoenix Wright: Ace Attorney. Oh, there’s nothing to feel nervous about! I hope we have a good chat today. Now, I’ve got to start by asking how an idea like this got off the ground in the first place. It’s not the kind of thing anyone would normally expect to happen, after all. I think I mentioned last time I was here that one of the games we were really conscious of when working on the first Professor Layton title was Brain Training5. Well, there was actually another game series that we were very aware of, and actually considered to be our biggest rival: Ace Attorney. We did a lot of research into how we could come out on top – how we could beat Ace Attorney.5. Dr. Kawashima’s Brain Training: How Old is Your Brain? : a Nintendo DS title that was released in Europe in June 2006. I’m afraid we’re not here today to talk about Ace Attorney’s weaknesses! 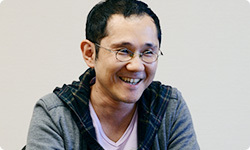 (laughs) Hino-san, last time you said that, when you were making Professor Layton, you wanted to “create the successor to Brain Training”. Considering this alongside what you’ve just said, would it be fair to say that without Brain Training and Ace Attorney, there would be no Professor Layton? I think so. Takumi-san had caught my eye as a creator right from the start, and after Professor Layton was released, I thought to myself that it would be great to do a collaboration between Professor Layton and Ace Attorney. First though, we needed to develop the Professor Layton series – otherwise there’s no chance such a collaboration proposal would have been accepted! As a result, I kept the whole thing secret. 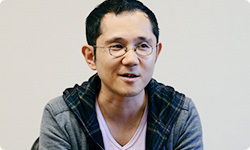 When was the first time you talked to Capcom about your idea in concrete terms? I think it was about three years ago, at the start of 2010. Editor’s note: “okonomiyaki” is a type of savoury pancake that is widely available throughout Japan. Oh, are we calling that an “incident” now?! (laughs) Still, I suppose that was the first time I asked Takumi-san directly if he’d like to make a game with Professor Layton. Did you know each other before that? We’d never actually met before, but I’d sent Takumi-san copies of the Professor Layton games, and received thank you letters in return. He always had something interesting to say about each individual title. So although you’d never met, there was a connection between you? Yes. Mind you, the ideas I discussed with Takumi-san that day were still very much at the pipe-dream stage. There were many twists and turns before things could really take shape, and it wasn’t until January 2010 that we started making official plans. And how were you involved with that plan, Takumi-san? At the time, I was working on a game called Ghost Trick6, so I wasn’t involved at all at the very beginning. When I heard that the project had started, however, I got really curious about how it was going to turn out, so although I kept my distance, I always had an eye on it. Then in May 2010, the producer invited me to a meal...6. Ghost Trick: a Nintendo DS software title, released by Capcom in Europe in January 2011. It is an adventure game in which a ghost who has lost his memory tries to solve the mystery of his own death. Ah, the Capcom tradition7! (laughs) You know something important’s on the cards when a superior invites you for a meal...7. The Capcom tradition: it is reputedly a tradition at Capcom for superiors to invite their staff for a meal when requesting changes or alterations to a project. You’re very well informed! (laughs) That was when I was told about the specifics of the project, and was given a supervisory role. I suppose it’s only natural that the father of Ace Attorney should be asked to take a supervisory role on this project. Yes, although to be honest, I felt a little bit negative about it at that stage. I had a strong feeling that I wanted Ace Attorney to remain in its own world, that things should be concluded there. I see, so you were a little resistant at first... When and how did that change? Well, I suppose it all started to change when the idea of “witch trials” occurred to me. I started to think about how Phoenix Wright8 would fare if he had to handle cases in a world where magic existed, and I found that it was fertile ground for the imagination.8. Phoenix Wright: the protagonist of the first three games in the Ace Attorney series. He is a young defence lawyer. All sorts of scenarios that could not have been done before suddenly became possible, did they? Yes. I felt that, since we were doing this collaboration, we were kind of obliged to do things that weren’t possible in the main Ace Attorney series. Since the characters of Professor Layton have a great affinity with that kind of world, if we could combine them, I had no doubt that we could make something really interesting. So your ideas initially came about precisely because you were a bit sceptical, but ended up being the only way you could make things work? Well, I couldn’t let my personal feelings pour cold water on the whole project. When I first went to meet LEVEL-5, that idea was all I had to offer them, so I kind of had to talk about it. I think that’s the nature of the creator. When something is asked of you, you are able to think about how you would do it, even if you don’t have any enthusiasm for the idea yet. I think that’s the kind of disposition you need. That’s right. It’s certainly not all smiles when these things are being discussed. At the time, though, I thought I was going to just present my idea and go home – I thought I would be leaving the rest to LEVEL-5. While we were talking, though, it was somehow decided that I would write the story for this title. I did think it was a little strange, but I kind of got caught up in the moment and ended up agreeing to it. Well, it had been our plan all along... And it worked!